Life Alert ® provides you with an audio monitoring system, along with a small help button. When you press the button, the system connects you to our monitoring center within seconds. 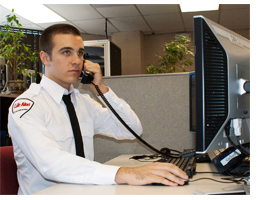 You talk directly to one of our security dispatchers, without needing a phone. Our dispatcher will hear the activity in your home, via the system’s sensitive microphone. In the rare event that someone is breaking in, our dispatcher can scare the intruder away with a loud voice over the system, telling him he has been recorded and must leave immediately. The dispatcher also contacts the police, and stays on the line with you until you feel safe.